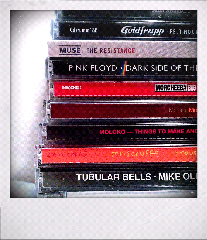 Pick 10 of your favourite albums to take to your desert island, the rules are: you have to own the album, you can't take "best of" or "greatest hits" or "live versions" and no compilations and you can't choose an album that's less than a year old You are allowed to take albums that pre-date you and you can change it each year. This is my selection so far...but I'm still tinkering, and have found the whole exercise really difficult but enjoyed doing it. This month's gathering was slightly earlier than normal, it wasn't because I wanted my cake-fix early, oh no, it was because we wanted to celebrate National Cake Week. Our hosts were The Tyneside Cinema, a well loved, well managed, well swanky independent cinema located slap bang in Newcastle City Centre. 3rd floor Cafe Bar - our venue for the evening! We were allocated a great little spot in their Cafe Bar on the 3rd floor, our cakes set up on along the back wall guarded surrounded by our 12 bakers and their guests. The venue provide a great selection of drinks, I stuck to coffee, but some bakers enjoyed something a little stronger with their cake. The venue was also open to cinema goers, and as they called in for pre-film refreshments they drooled at our fabulous array of cakery. Once we'd had our fill, we invited the staff from The Tyneside Cinema to help themselves too - as a thank you for letting us use the venue, we had so much cake left! This month we encouraged our bakers to bake for National Cake Week, choosing either a traditional cake from another place (county, country or planet) or select an ingredient from another country. And our cake bakers didn't let us down - they were all out of this world. If there was ever a cake I'd wanted to try for a long time, it was the Chocolate Guinness cake. So thank you to Nancy for baking this. And it was as beautiful,as rich, as dark and as delicious and ohhhh as I'd imagined. You only need a small piece, and I guarantee you will be transformed to a special place made of cakey loveliness. I did experience tingles down my spine when I ate this. The Tyneside Cinema: Pilgrim Street, Newcastle upon Tyne, NE1 6QG. The perfect venue, great team of staff, and drinks (hot, cold, fizzy, strong)! Hayley & her White Russian Cake - for agreeing to be snapped for the article! The next gathering had already been booked, and before we left that evening, we'd agreed upon a theme of Winter (& I added Wonderland, so I could steal borrow the lyrics from a famous Winter Wonderland song) and there are about 9 cakes already booked in. See the Clandestine Cake Club website for more details and how to book a place. I baked (for the first time) a double espresso & brazil nut cake, which I found in a supplement from the Guardian (given to me about 4 yrs ago). The cake was for the October gathering of Clandestine Cake Club I didn't do a practise cake and just went for it, was this my undoing? And, I made an adjustment to the recipe: instead of using espresso powder, I used ristretto nespresso coffee. This is a number-10 rating on the coffee scale, which I'd equate to an espresso hit. However, when 'dispensed' through the machine it's liquid, and the recipe asked for powder. However I took this into account by reducing the amount of milk the recipe asked for, hoping that would fix it. It was a sloppy mixture, and I went through a whole raft of emotions in the mixing process, and I didn't trust the process and added another 50g flour, because it just looked far too wet. Was this my undoing? When cooked it looked fine. I cooled it overnight and kept it in an airtight container. The night before cake club I mixed up water icing and coffee, filled it, and topped it in icing, dressed it in brazil nuts (in a pretty flower pattern) and put it in the fridge. Was this my undoing? In the morning, the top had slid off the cake a little bit and a giant earthquake type crack had appeared across the cake (taking a lot of the icing in at the same time). Not sure why this had happened, and did a quick repair job of a second coat of icing, removing and crushing the nuts. The taste: at the Clandestine Cake Club I had a few people tell me how nice it was, one person said that it was as nice as her granny used to make (a fantasic compliment to receive). But for me, it didn't have that great big woah, smack in the mouth coffee hit that I was looking for, and it also lacked moisture that I wanted too. I will make sure there is a next time. On Thursday we woke to a beautiful sunrise and 'light' at the Jonas Centre: the light through the trees surrounding the cabins was stunning, and armed with the camera (8.30am) I headed out into another field to capture the sunlight and mist through the trees. I'm not sure which is my favourite, but they're all very calming, relaxing and peaceful. I'm not sure which of the 3 I prefer? 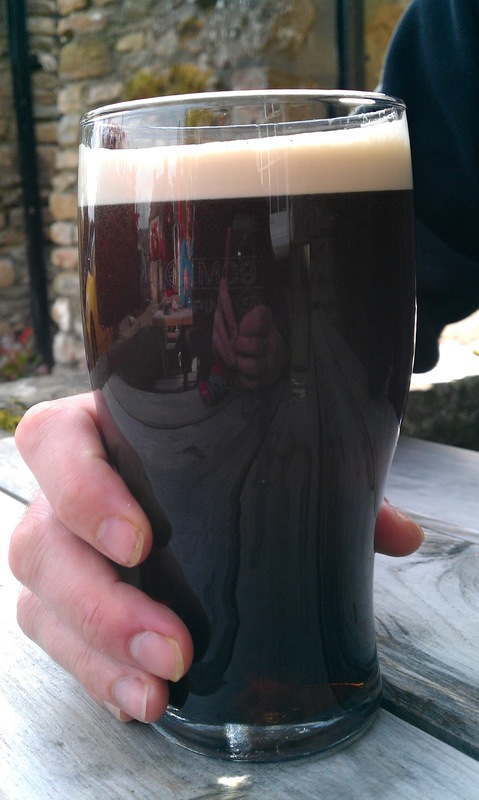 When we arrived at the Black Swan, Fearby (1.5 miles from Masham) the smell of yeast and breweries hit our noses. We didn't hang around long, we asked for directions to Masham and headed off (off-road, on foot) to Masham. 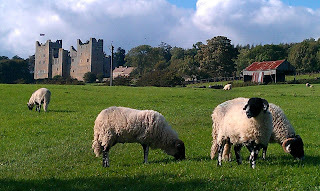 Our trek encountered sheep, cows, some very friendly horses and more exciteable pheasants! By this time the sun was high and roasting us, so we stopped off at Suncatcher's Cafe, which fortunately wasn't in the sun at the time, it was in the cool shade - just what we needed. 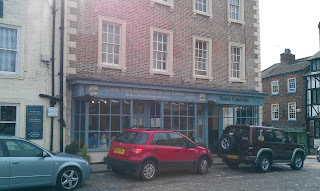 They served a great latte (for me) and tea (for Carl) accompanied by 2 warm and juicy scones. After sustenance we headed over to The Black Sheep brewery to check on tour-times and book in, the earliest we could get was 3pm, so we had to 'amuse' ourselves until then...What to do? We went to the other brewery and see what time their tours are (and have a beer while we're there). So back across the town we went to Theakstons and sampled their Paradise Ale (for me) - a fruity little number and Lightfoot (for Carl). Their tours were operating at the same time, so we decided we'd leave it and just do the Black Sheep one. 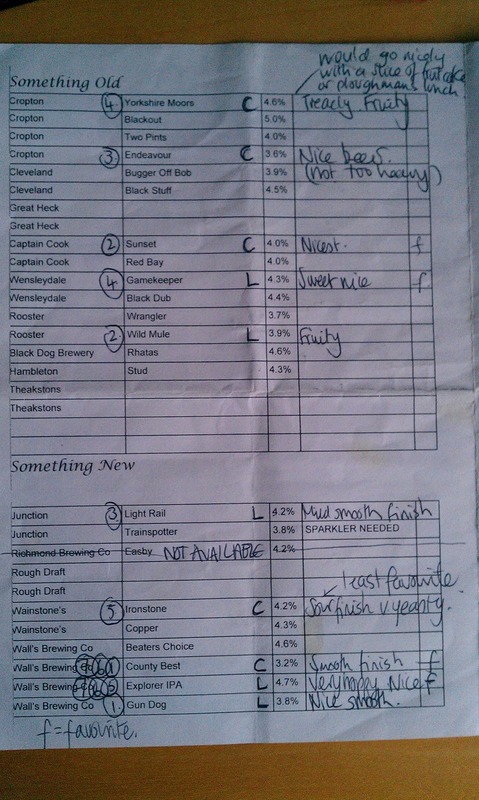 Which Theakson's ale should I choose? With still an hour to kill and 1 beer supped, we had lunch in The Bay Horse, a pub on the front which specialised in 'Real' this and 'Real' that - so we decided to see if this 'Real' claim was as 'Real' as they said, and went for a sandwich with 'Real' chips. Carl had ham baguette and I went for sausage & chutney baguette - and we had a bit of each others. The bread was warm, the sausages juicy and the chutney tangy. The chips were a real as their claim: thick cut and floury. This was all washed down with a beer (Black Sheep for me & Mr Lisa). Good choice! Which Black Sheep ale should I choose? As happy as a pig in muck, or drunk? We went on the tour, which was okay as far as tours go, I thought the half-pint sample at the end was a bit tight (at the Guinness one they give you a full pint of Guinness). A spile lets the air into a barrel (first a wooden one, then a plastic one). I also broke my zip on my jeans (the zip was already half broken - it wouldn't stay up), but this time it came off the runners, so I was walking with my flies open. Lucky I wore a long top. Outside was baking hot so we stopped at Joneva (on the market place) for ice cream, I went for 2 scoops: Cappuccino and Apricot & Ginger and Carl went for Mint choc chip and Wild Cherry. Our return journey to The Black Swan avoided the friendly horses; Carl wasn't too happy about them nuzzling his new rucksack and sniffing his ears. The accommodation was in a separate block at the rear, each looked like a little cottage, one window downstairs and one upstairs. Ours was a downstairs: the door opened up into a massive room, with kingsize bed (2-singles joined together), wall mounted TV (if you fancied it), desk with tea/coffee making, hairdryer, comfy chairs, table, usual local literature and massive wardrobe. There was a single window at the front, with sash window. At the back an ensuite bathroom with bath and shower. The room had a gorgeous wooden floor with underfloor heating (not that we needed it), a stone floor in the bathroom, dimmer lights, a comfy bed and good quality linen. The room was finished and made up to a really high standard, and had either just been done (in the last 3 months) or was really well maintained. It was pretty luxurious compared to the last few nights, and it was great to have a shower and dry my hair with a hair dryer!! The pub has a real rustic, old style charm, boasting a fine collection of porcelain potties hanging from the ceiling, but also cheery and bright, with a fresh feel about it at the same time. There were probably another 5 couples having dinner in the restaurant that night, all of which (I assumed) were staying. We pondered the menu over a Black Sheep beer, and shared our starter of black pudding, bacon and baked goats cheese starter, followed with a sirloin steak (each): a generous, thick, 10oz sirloin cooked rare (to perfection) and finished with a green pepper sauce. It was served with fried tomatoes, which were spot on, mushrooms and chips (thick rough-cut, skins on, and really tasty). I finished with a treacle tart, and ice cream, I loved that sticky sweet syrupy crumby filling you get inside the pastry case and tried to think back to the last time I had one....Ages ago. 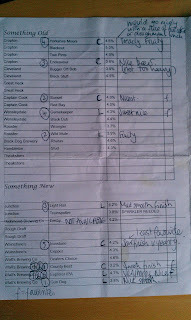 We had a few more Black Sheep ales before I gave up and had a cup of tea instead. 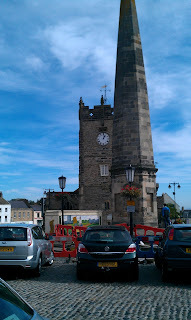 I think I'd like to move to Masham and live there, it seems to have everything close at hand. Maybe if I won the lottery I'd move there, or have a holiday home there. I picked some Yorkshire sloes on a recent holiday and brought them home to make sloe gin using a recipe from the lovely Nigel Slater. Put the lids on the bottle. Shake each bottle until the sugar dissolves. Store the bottles somewhere cool and dark. Each week shake the bottles to mix everything up. Nigel didn't actually say how to serve the sloe gin, my feeling was that I'd pour it though a tea strainer and leave the sloes in the bottle to keep the flavour intensifying. As for how to drink it, I'll be drinking it with ice, if you're unsure then try with lemonade, soda or tonic. 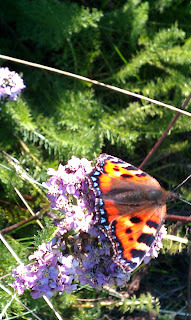 Picked on 27th September from Redmire. Made into sloe gin on Sunday 2nd October. After 2 days of bicycling and/or shopping we'd decided to have a more leisurely day; drive to Hawes and explore the area on foot. 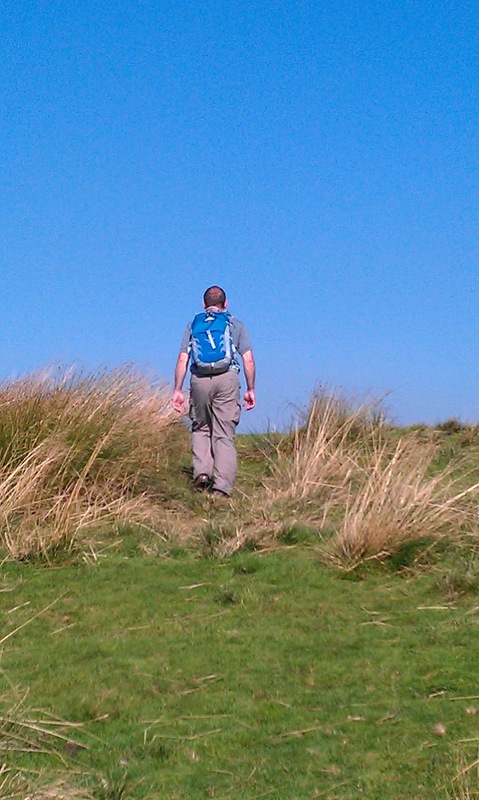 Armed with sandwiches, walking boots and an Ordnance Survey map we decided upon a circular walk: Hawes > Gayle > Hardraw > Hawes. I was head of navigation, for a short time, until we discovered I'd taken us slightly off route, 3 fields away from the track we needed to be on. So Mr Lisa took over at the helm. It was a beautifully warm, sunny day, there weren't many people around (doing the same route) and we took things at a steady pace. The walk took us over fields, tracks and up hills, and it was nice to get out into the middle of nowhere. 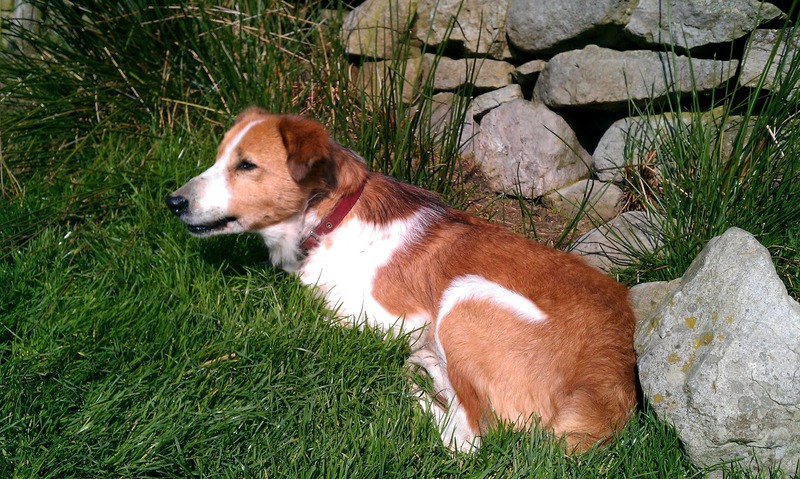 There were plenty of excitable moorland birds, mostly grouse and pheasants and for a short time nearly adopted a farm dog. Back in Hawes, stopped at The Crown for a pint of beer to quench our thirst, and onto a teashop for cake and a cuppa (my second coffee cake in 2 days). We booked into The Sandpiper Inn (Leyburn) for dinner, and it was well worth the visit, our favourite meal of the holiday. The food was absolutely delicious, everything was cooked to perfection, the meat was tender and the accompanying sauces complimented the flavours. 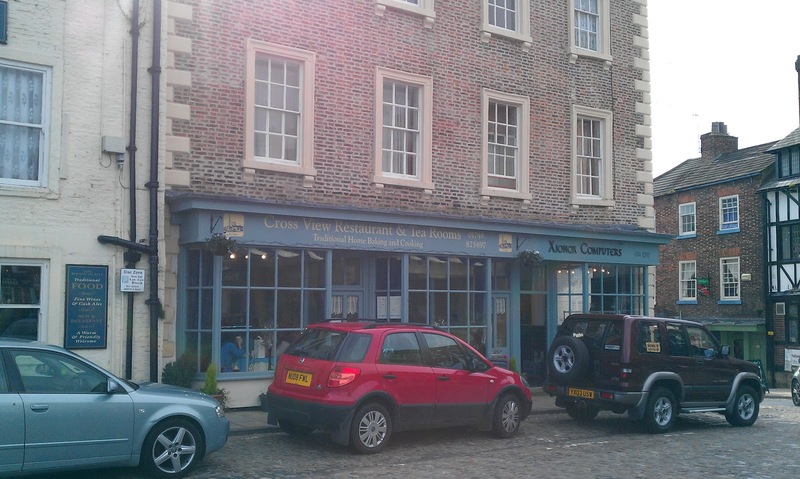 We were very very pleased we gave Leyburn another try for dinner. The weather was good, Carl wasn't aching from the bike ride yesterday so we agreed to split up: Carl was going off with some bike and I was going off shopping to Richmond. Deal. I dropped Carl off at The Dales Mountain Biking Centre and left him to it. 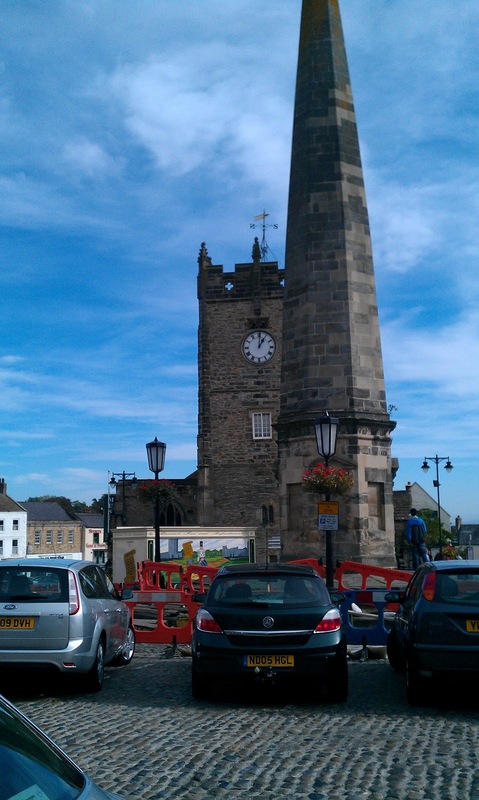 Grinton to Richmond was a 10 mile drive, I parked on the market square and had 2 hours to shop before I had to move the car. The next shop along from York House (or there abouts) was a great little deli called Jeffersons their window had a map of the region which pin pointed the items they stocked and where they came from - a great idea! 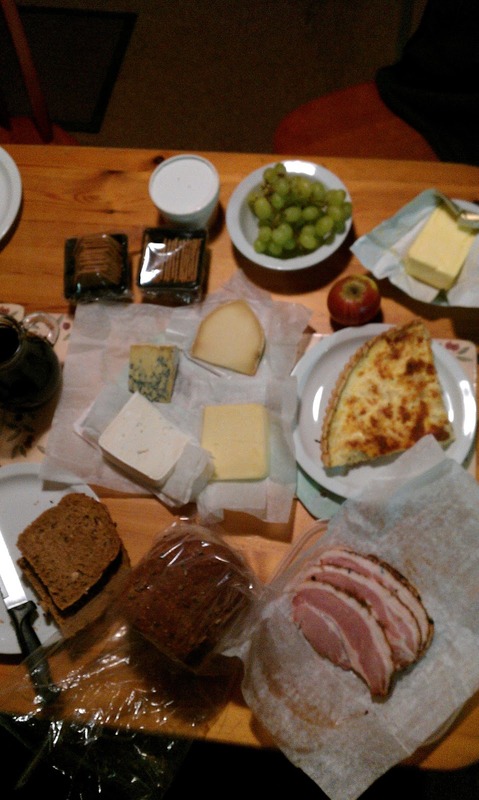 Part of my mission today was to return to the ranch with Yorkshire Tapas, a selection of cheeses and nibbles so that we could stay in the cabin for dinner, and save a few pennies. I decided to re-visit them later on my rounds. By this time I was hungry, so called in at Cross View Tearooms, and had a really great sandwich, one I'll recreate back home: Wensleydale, Apple, Walnuts, Mayonnaise and Mango Chutney. They all worked so nicely, crunchy and tarty yet sweet and creamy, it was very delicious. And the lovely lady in there who served me also lent me her pen, as I was also trying to do some Clandestine Cake Club homework. Time was running out on the free parking, so I went back to Jeffersons and got 4 local cheeses, a great Apricot chutney (as recommended by the owners), a big slice of cheese (coverdale) and onion quiche, some crackers, some gorgeous thick-cut ham and a free tub of pease pudding (lucky Mr Lisa - I'm not a fan). I also bought a nice seeded loaf from Peters Bakery in the town too. Next stop - some photos down by the river Swale, and the waterfalls, followed by a 10 minute walk to Cornforth Hill. Why? Cornforth is my maiden name, and about 25yrs ago I had my picture taken next to the sign by friends on a day trip. 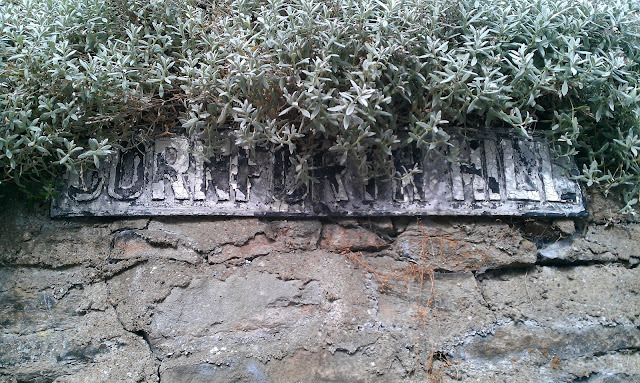 The sign's looking old now - you can hardly make it out, but it does say CORNFORTH HILL. We nipped over to Reeth, for an ice-cream (yes we'd only just eaten cake) and had a suprise visit from the Air Ambulance, which landed in a field just behind us. On our Sunday walk around Redmire, we found a large collection of sloes and decided that we'd take ourselves a small bag and make our own sloe gin and call it Redmire Sloe Gin. So at dusk we headed out to pick sloes, had a stop off at The Bolton Arms in the village and went back to the cabin for our local dinner. 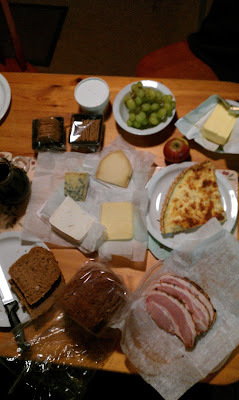 Dinner was a pick & mix menu of local produce, cheeses, bread, ham, flan - mostly from Jeffersons of Richmond and wine (the only thing that wasn't local) - a tasty selection of yumminess. On Tuesday I decided to be a "lady" and attend a "Ladies' Lunch" event at Blackfriars in Newcastle, this was the 3rd month of "Ladies' Lunch & Talks" organised and run by Blackfriars. Previous talks, as I understand included one on champagne (how did I miss this?). And the one I went to on Tuesday was all about make-up. I'm one of those people who has had the same routine for years: moisturiser, foundation, bit of blush & curl the eyelashes. If I'm going out on an evening I'll venture into a bit of mascara. 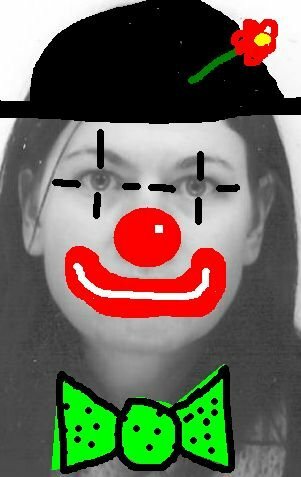 As for eye-shadow, eye liner and lipstick, whether worn individually or tried all together, I just look like a man in drag or a clown. Don't ask me about what I think about the women who work on make-up counters, that's just another scary world that I don't want to venture into. The talk was delivered by Kerry Nicholson of The Perfect Base, her credentials included make-up artist to the cast of Emmerdale, several films, TV shows including something called 'Geordie Shore?' So she knew her stuff, and when I was asked to be her glamourous guinea pig assistant, I felt like I was in safe hands. Kerry doesn't just do talks like this, and make up to the stars, she also does classes, tuition, weddings, promotional events, parties and makeup shopping. The talk, interspersed with questions, queries and quibs from a lively audience of 8 of us went on for over an hour and a half! We were aged between 20-something and 60-something, each of us had varying degrees of make-up experience, skills and confidence. We might have only been a group of 8 but we all had our own little niggles and took full advantage of Kerry's expertise. Kerry answered all our questions, she was very thorough, patient and was pretty much a font of knowledge on all things makeup, products, brands and tools of the trade! What I especially liked about Kerry's talk was that she had a knowledge of a wide range of makeup products, tools tips and tricks, it wasn't all about buying expensive products or kit. 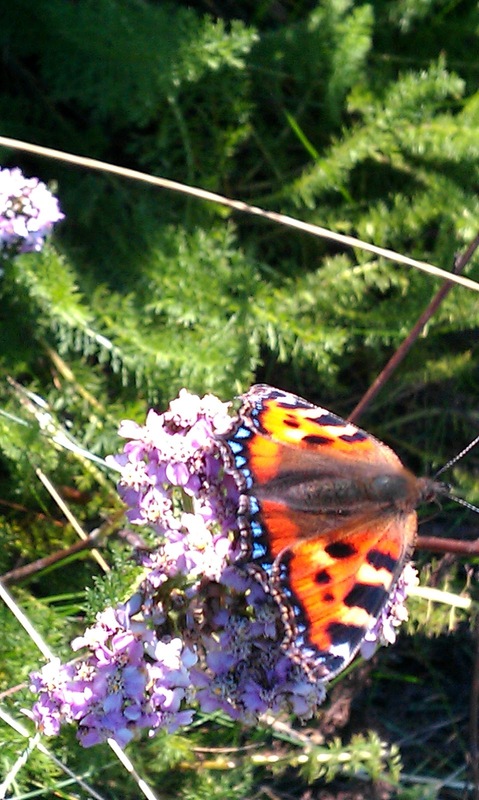 This service was just what I needed, something you don't get from the makeup counters in Boots/John Lewis/Fenwicks etc. Well I know now what order I should be applying things. Primer: the stuff that smooths out indents, wrinkles etc. *Eyes - I got a little frightened at the eyes: she applied eye liner all the way under the eyes something I never do - it's the look I never go for. The audience loved it, they commented on how good it looked, I winced and shook my head and Kerry took it off for me, the crowd weren't happy, but I want makeup to make me feel confident, and that look wasn't doing it for me and Kerry (the expert as always) realised this, and acted on this. I went with a couple of friends, Catherine and Sophia, who both took 'after' photos, but I'm not uploading them into here! I also learnt that I might have a new venue to try for Clandestine Cake Club events & will be in touch with Blackfriars soon to discuss the details! The lunch was eaten in Blackfriars Restaurant on a large communal table, we chose 3 courses from their Express Lunch menu: at least 4-5 starters, mains and desserts. One of the reasons we chose this part of the country was because of the biking - mountain biking to be specific. I don't really look like a mountain biker, and to be honest, I'm not. I have a bike, I can ride, I don't like uphills but I love downhills. Mr Lisa on the otherhand is a mountain biker, he does ups and downs, offroad and onroad, and not just on holiday. He'll ride to work and back! Carl was particularly interested in visiting The Dales Mountain Biking Centre, over the hill (literally) 4 miles away in Fremington (between Grinton and Reeth). The centre offered bike hire, local rides, training, accommodation and a cake shop. We arrived early-ish and chose a 'gentle' ride (as Carl requested) which took us along one side of the river Swale, over the bridge to the other, along to Gunnerside, crossing the river again and back to Fremington (a 15 mile round trip) with an optional pub stop at Gunnerside. The first part of the ride was horrid, up a steep hill, I did have to get off and push. It was far too early in the morning for me to be riding up hills like that. Fortunately that was the steepest bit of hill in the entire ride, so it was good to get it done early. The route took us off the road and onto tracks, the downhills were puddly, muddy, rocky and wuhoooooooooooo and the uphills (though not many) were slow and always began with a handful of swear words from me. Carl was suprised at the amount of energy expended in complaining about the hill before I'd actually ridden it. But that's just "my coping mechanism." There was a horrid-horrid road bit just before Gunnerside, but the free-wheeling into Gunnerside was nice, and a can of coke in the beer garden was just what I needed before the return journey. The journey back was mostly off road, it was a great mix of rubble-rocky downhills, mud-tracks with deep puddles (which I couldn't help but ride through), a cobbled bit which ran right along the riverside, really tricky to ride - but I did it, which turned into a grass path, slow but ending with a slope into a singletrack, and rocky-muddy stretch, we finished back on the road we started, and into the Dales Mountain Biking Centre for food (& cake). I still don't have great technique going up; I sit back and pedal like buggery, and going downhill I'm a bit reckless; I hold on tight, let the front suspension ride the bumps, I'll keep my balance, whooping and squealing with excitement, then get to the bottom and think about what I'd just done, and how fast I'd just done it. Our route: Fremington - Gunnerside - Fremington (abt 15miles) Top Speed: 28mph! Back in The Dales Mountain Biking Centre cafe, we compared mucky legs (Carl's looked worst, because his are hairier than mine), he washed the bikes, we got changed and enjoyed a late lunch, which did include cake. 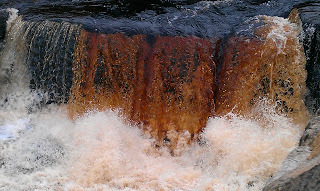 Dinner that night was at The Bridge Inn, Grinton - a cosy place right by the river, before you get to Fremlington. We both opted for specials, Carl chose grouse and I chose monkfish. Mine was delicious, meaty fish with a sweet, buttery, fennelly sauce. Carl's grouse had a real gamey taste, I'd never had it before - and was expecting something like pheasant, but it wasn't it was more like venison in taste and texture - which wan't what I'd expected. I was designated driver, and took us back over the hill to Redmire. At the top we stopped to look at the stars - it was such a clear night we could even see the Milky Way. Our holiday officially began on Sunday. 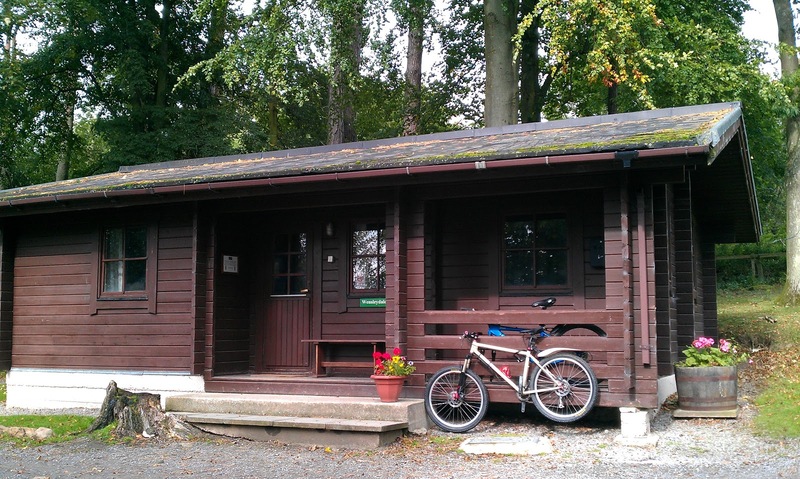 4 nights at the Jonas Centre log cabins, very basic, furnished in a caravan-esque style. 4 rooms: bedroom 1 (2 singles), bedroom 2 (1 bunk, 1 single), bathroom (bath, loo & sink), open-plan living, kitchen-diner. The kitchen had everything to survive: fridge, microwave, cooker & oven, if you fancied a spot of cake making. You had to take your own duvet covers, sheets, pillowcases & towels but for 40quid a night I wasn't going to worry about that. 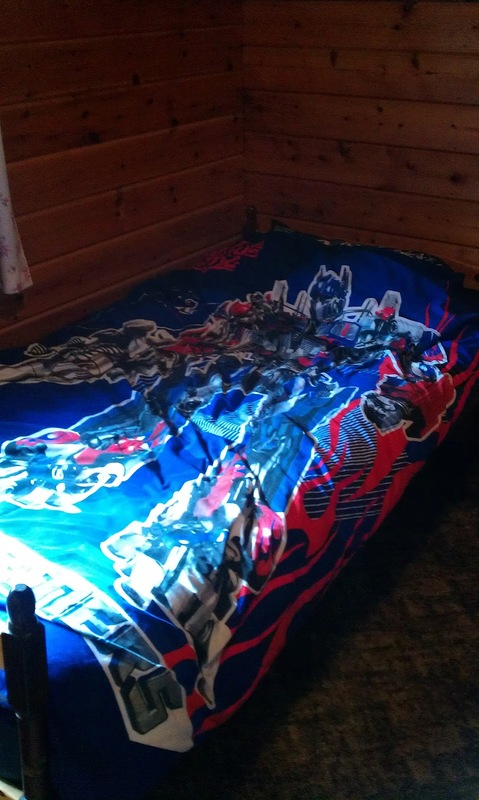 We don't possess 2 'adult' single duvet covers, so Carl slept with Optimus Prime (or on the reverse, Megatron). 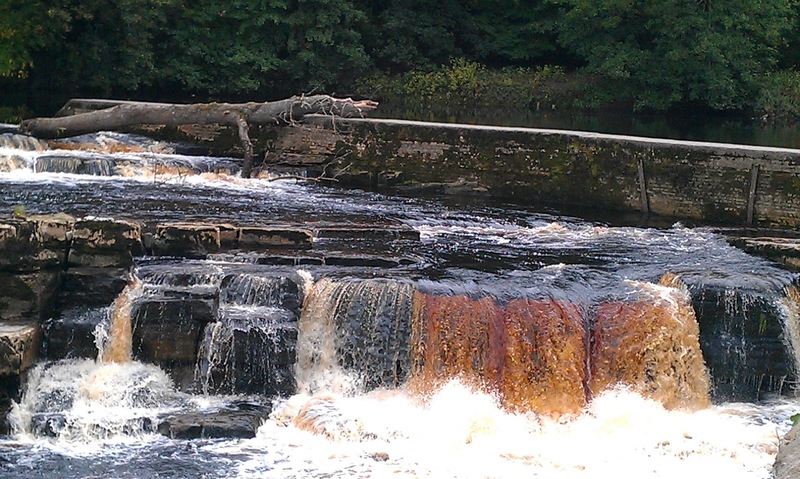 It was warm, dry, fairly quiet (will explain what I mean later) and ideally located for a holiday in the Dales. The centre is run by a christian group, but the cabins are hired out as a separate holiday-let business. There's no pressure to partake in anything religious, but there is a prayer barn on site if you get desperate and need to go. 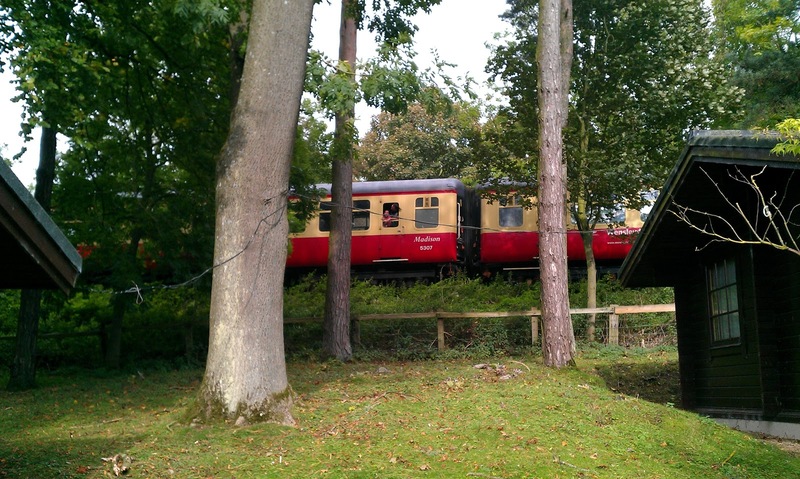 The Jonas Centre is just outside the village of Redmire, Redmire is the last stop on the refurbished, fully functioning Wensleydale railway line, and the cabins we stayed in back onto the railway line. We got quite a shock when we arrived, seeing how close the line was, but they stopped running at 4pm, so it wasn't like they disturbed our sleep. My sister had stayed at the Jonas Centre back in August and highly recommended The Bolton Arms in Redmire. So once we'd unpacked we decided to give it a go, the sun was out and the pub was full, but the beer garden was our seat of choice. Half a Rudgate's Ruby Mild (Rudgate are York-based) and 2 ploughmans lunches: 3 hunks of cheeses (lancashire, Wensleydale with cranberries & a blue cheese), a couple of thickly cut slices of ham, homemade coleslaw, a serving of chutney, a pot of pickled onions, a chunk of warm crusty bread and a token salad. It was a perfect lunch for a perfect Sunday afternoon. 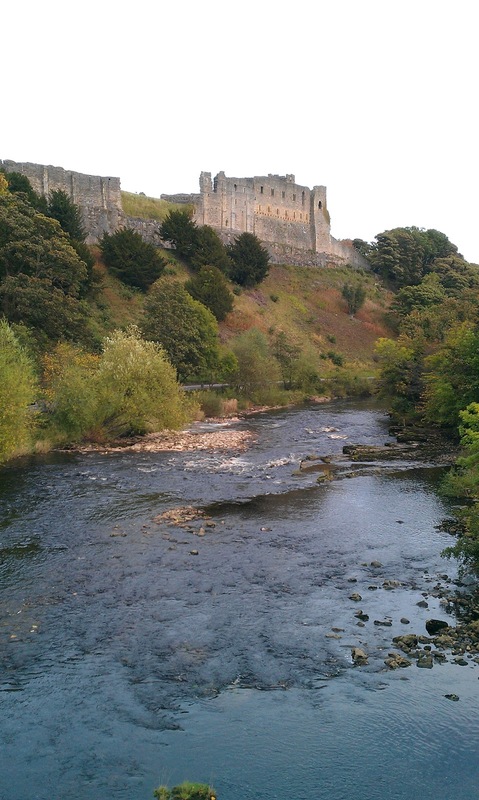 We walked off a bit of the lunch by taking a detour back to the cabin, via an off-road route to Bolton Castle and Castle Bolton (one is the castle, the other is the village with the castle) - only about 3/4 a mile away. We went into Leyburn (4 miles away) for dinner, annoyingly we hadn't done our homework: checked out Trip Advisor, asked Twitter etc, and just went in somewhere that looked okay. The Bolton Arms in Leyburn (a different Bolton Arms & no relation whatsoever) was the chosen eatery of the night and sadly the food was a complete contrast to earlier, their 'Bolt Burger' tasted like a chuck-wagon burger, onion rings were soggy, chips mediocre. The nicest part was the tomato relish. It was a really disappointing meal. On our way back to Redmire, we decided to have a proper drive through the town, and spied The Sandpiper Inn, after further investigation on Tripadvisor - this was ranked as the top restaurant choice. Bugger. Mr Lisa and I took a well earned week off work. Our plans were a little sketchy: some biking, walking, beer drinking, cheese eating, cake munching and shop mooching. In no particular order, with no particular priority. Accommodation was booked on Saturday 24th (mum's house, Brompton, Northallerton), Sunday 25th - Thursday 29th at The Jonas Centre (Redmire) and finally 1 'luxury' night at The Black Swan Fearby, near Masham (pronounced Massam not MaSHam). 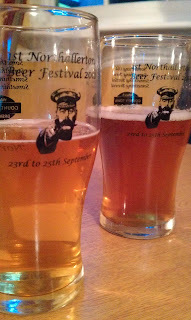 Our holiday began on Saturday - a bonus day really, we'd discovered (to our pleasant suprise) that Northallerton was holding it's own (first) beer festival. 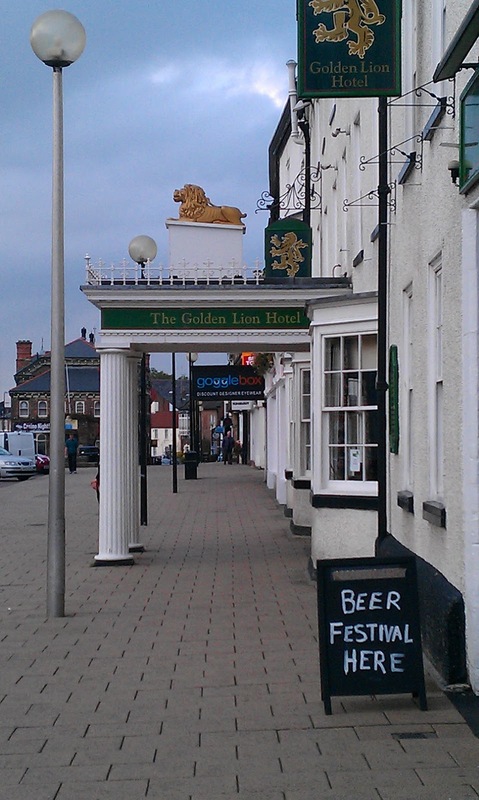 It was held in the Golden Lion Hotel, and raised money for the Ben Hyde Memorial Trust a local lad who was killed in Iraq in 2003. We made our way there for 6pm, tried a range of beers, talked about which one we like the best (and why), then finished the night on our 'favourite' or in our case, finished on 3 halves of our favourite. What's a beer festival? : you pay an entry fee, you get a glass and a list of the beers, the brewers, the alcohol % and sometimes a description of the flavour. You then pick your beer, and buy from the bar by the pint or half-pint. We stuck with half-pints, but they were quite generous with their measures :) Unfortunately there wasn't a beer-description, which was a shame because I tend to choose based on the flavours. 7 halves each later (that's 3.5 pints) we decided to call it a night, until the band started up, and we stayed for another 3 halves more. Favourite beer (for me): Wall's Brewing Co "Explorer IPA"
Favourite beer (for Carl): Wall's Brewing Co "County Best"
We then went round the corner to Aroma, Zetland Street for a quality indian meal before walking the 2.5 mile walk back to my mums house (via the village green to collect conkers) - don't ask.